Tasks can be assigned to Contacts (even from Meetings). Due Date - The date due for a one-off Task type. Start Date - For a Task that repeats, you can set a Start Date. End date - can either be set to "No end day" (which means the Task will repeat until it is turned off) or "End by" for a finite end date. Followers - Contacts from within your Organisation can be set as Followers who should be notified when the Task is either updated or completed. You can have multiple Followers for a Task e.g. your Committee. 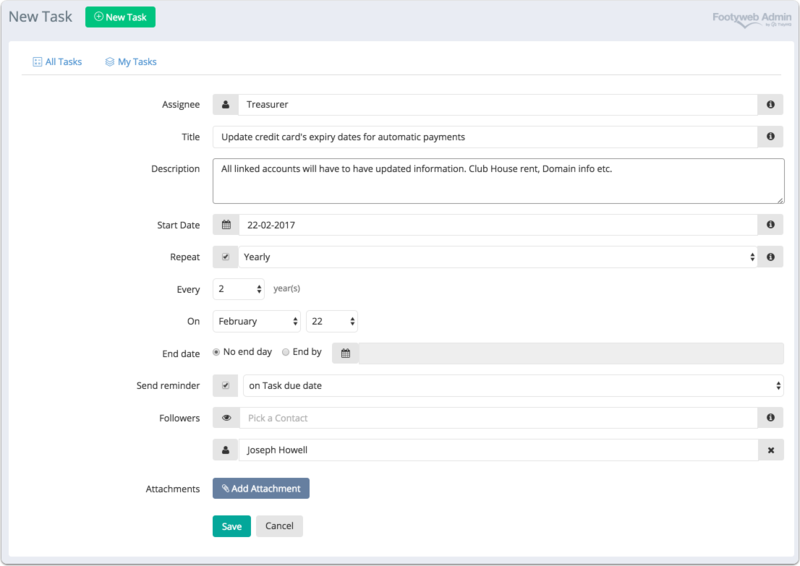 Attachments - You can add Attachments, where required, to a Task. The Attachment is also then available in the Storage area, under Tasks.